Having been under constant fire on the twin issues of corruption and governance, Prime Minister Manmohan Singh today sought to set the record straight on both fronts with a special New Year message to the nation in which he delineated the UPA government's future roadmap and reiterated his personal resolve to "provide an honest and more efficient government." 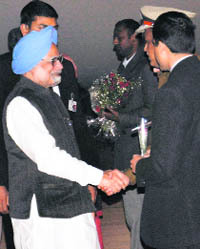 PM Manmohan Singh in Amritsar on Saturday. People�s Party of Punjab (PPP) chief Manpreet Badal today released Sanjha Morcha�s first list of 41 candidates for the Assembly elections, most of whom are political greenhorns who quit cushy jobs to join politics. Pakistani authorities have cleared the import of 16 vegetables and raw jute from India through the Wagah land border in order to bring down prices in the domestic market and added 18 more items to the list of goods that can be imported from the neighbouring country. Love it, hate it but you can�t ignore it. Such is the musical blitzkrieg launched by Punjab politicians, cutting across party lines. If the launch of the Punjab International Film Awards (PIFA) in Toronto in August next year, which was announced here last night, is any indication, Canada and its provinces have joined the select band of Western nations that have accepted Bollywood as an engine of economic growth to negate the global slowdown.